August 5th, 2014 by Roy W. Spencer, Ph. D.
The global image for July should be available in the next day or so here. We’ve just had a solar peak and a developing El Nino but little or no increase in temperatures despite increasing CO2. The models are not going to be vindicated any time soon despite the hype earlier in the year about an El Nino driving temperatures to the highest level yet. The strangest thing as I see it, is the seeming fact that global SSTa has risen considerably over the last year or so, basically in two prominent peaks. But neither land nor troposphere have followed suit. As of yet at least. That’s fairly unusual. It might have to do with the fact that what appears on the charts to be global sea surface warming over this period hasn’t really been global at all. It has been very much confined to the North Pacific. What data sets are you looking at because I still see a cooling in the tropical pacific and I would like to understand this statement more. Stephen, I think you are going to be correct, but it is still a little early to know if there will be an increase in temperature from El Nino. More of the same and solar is not any where near my criteria for cooling effect, although overall solar activity has been quite low post 2005 despite this recent maximum of solar cycle 24 which is now in the process of ending. Once it ends solar conditions should approach my criteria over a long duration of time which should start global temperatures on the decline. What has taken place in year 2005 is a complete change from active to inactive solar activity. This change in my opinion will be more then enough to have another climatic impact just as is the case when one reviews historical climatic data. My challenge remains- Which is to show me the data which shows a prolonged solar minimum period being associated with a rising temperature trend or a prolonged maximum solar period being associated with a falling temperature trend. I find no such data and the same result is going to happen as this decade proceeds. Already solar activity is falling off and we are no where near the bottom of the solar cycle 24-solar cycle 25 minimum. I think the data (especially post 2005/prior to 2005 ) supports the view that the sun can be quite variable and this variability can happen over a short period of time as is the case in the first decade of this current century. Expect climate implications if this prolonged solar minimum keeps advancing going forward. The problem with so many postings is there is a lack of understanding of noise in the climate system, thresholds in the climate system ,lag times in the climate system and that the climate system is non linear and never in the same state. Therefore my point (which I have made many time previously) is DO NOT EXPECT an x change in the climate from given x changes in items that control the climate. This I have preached but with little fanfare. The initial state of the global climate. b. climate was closer to the threshold level between glacial and inter- glacial 20,000 -10,000 years ago. This is why the climate was more unstable then. Example solar variability and all items would be able to pull the climate EASIER from one regime to another when the state of the climate was closer to the inter glacial/glacial dividing line, or threshold. The upshot being GIVEN solar variability IS NOT going to have the same given climatic impact. Solar variability and the associated primary and secondary effects. Lag times, degree of magnitude change and duration of those changes must be taken into account. Upshot being a given grand solar minimum period is not always going to have the same climatic impact. This is why solar/climate correlations are hard to come by UNLESS the state of solar activity goes from a very active state to a very prolonged quiet state which is what has happened during year 2005. So the nonsense that post Dalton no definitive solar /climate correlations exist just supports my notions of what I just expressed. Meanwhile, a quiet sun is correlated with a stronger more meridional jet stream pattern which should cause a greater persistence in Wx. patterns which I think is evident post 2005 for the most part. Salvatore, Have you looked at the Solar Notch Theory posited by Dr. Evans at http://sciencespeak.com/climate-nd-solar.html? What are your thoughts on the Solar Model? I have updated your graph in my climate and weather pages. We keep on watching nature do as it does. It has been a half decent summer across in the UK, nothing on par with the glorious summer of 1976, when they were talking about a mini ice age. Piers Corbyn says we will have a record August heat wave in central UK, I don’t see one coming. What happened those two years? 1992 and 2005. I still wonder. Always enjoy your updates Dr. Spencer. Here in the US Cornbelt, we had a very dry July, which normally means deteriorating crop conditions. However, the very cool temperatures minimized stress, along with the increasing benefits of atmospheric fertilization that continue to increase each year. Mondays USDA crop rating for corn was very high for this time of year at 73% good/excellent. Soybeans were way up there too at 71% good/excellent. That report, released yesterday afternoon after trading had closed, was a bit of a bearish shock to the markets, especially soybeans since expectations were for the dryness to cause a drop in ratings. An often overlooked element in crop model forecasts is the increase in CO2. At current levels of CO2 for soybeans for instance(that use the C3 pathway), each 5 ppm(parts per million) of CO2 fertilizer that is added to the atmosphere, increases growth(plant weight/biomass) by roughly 1%. Just since 2010, CO2 levels have gone up another 10 ppm and along with it, soybean growth up 2%. Genetic enhancements to hybrids of all the crops get most of the credit for increasing yields………but much more than they deserve. If atmospheric CO2 was cut back to pre-Industrial Age levels, below 300 ppm, we would see a yield reduction of 20% or more in many crops. Folks were amazed at some of the yields in the drought of 2012, compared to the yields after the last widespread drought in the Cornbelt, in 1988, 24 years prior. Improved technology and farming practices have made incredible increases possible. However, one of the biggest benefits of increasing CO2 to plants is with regards to water efficiency. A couple of rains in August and avoiding an early freeze(September) in this persistantly cooler than normal weather pattern and this years corn/soybean crops should be a record. Someone posted a while back how he had noticed, as a visitor to France for the last 60 years, transformation in the French countryside; hard-scrabble farms abandoned, and replaced by Nature with ever expanding woodland and meadows. CO2 is a vrai tonic for plants. Thanks for the crop up date Mike. We saw the same thing here in mid NC. We had a droughty July too but my white clover never turned into crispy critters as it usually does by mid-June. This is the second year I have has clover blooming all summer long. Something I had not seen in the twenty year prior to this that I had my farm. I imagine it is difficult to mentally associate Europe’s temperature trends to global ones bc the regional climate is so dependant on the strength of the gulf stream, which heats Europe more when N Atlantic Deep Water gets colder. Thus, Europes climate is commonly out of phase with the global trends. I am curious if this contributes to what i perceive as the strong buy into AGW by the general European population. England had some mild winters a decade ago. That was a “confirmation” for many people that global warming “had happened”. I was amazed by a local official at the time who told me that there was no need for snow-plows any longer. He went further and SOLD our county’s stockpile of grit! When, a few years later, we were crippled by a month of snow, he was already gone – with a fat, inflation-proofed, pension. >>England had some mild winters a decade ago. That was a “confirmation” for many people that global warming “had happened”. And meanwhile the same people claim that the record cold and snow across America meant the same thing… and then they \ deny hand-picking information. I agree– they simply twist ALL Of it to suit their agenda. buying into global warming tracks closely with buying into big government, at a personal or regional level- they correlate far better than co2 and temp. ever did! The Little Ice Age was right about when the Holocene reached half precession cycle old and that was a few hundred years ago. The Modern Warm Period, less warm then the the Medieval Warm Period, marks the second thermal pulse. There were two thermal pulses in the closest Holocene analog, MIS-11 just before glaciation. Lisiecki and Raymo, 2005,essentially quashed Berger and Loutre’s 2002 modeling that was the last hope that the Holocene would be a ‘double precession-cycle’ interglacial like MIS-11. There has been no rebuttal. Lisiecki and Raymo produced an exhaustive analysis of 57 globally distributed deep ocean cores reaching back about 5 million years. If Ruddiman’s “Early Anthropogenic Hypothesis” is correct, the ONLY thing keeping us out of the next ice age is carbon dioxide. The Industrial Age along with the the recent grand solar maximum, may very well have occurred at exactly the most opportune time to keep us out of glaciation, but we are not out of the woods by a long shot. The Milankovitch Cycle low point will continue for 65 thousand years according to Lisiecki and Raymo. The earth is a heck of a lot closer to glaciation than it is to peak warming. So whether or not the next solar dormancy cycle plus other factors is enough to kick the chaotic climate system into a different “Strange Attractor” (Glaciation) is a crap shoot as Salvatore Del Prete keeps pointing out. The fact that several papers have found a correlation between solar minimum and volcanic activity doesn’t help matters either. The earth is patient, she has all the time in the world and the one thing we can be sure of is sooner or later glaciation will revisit the earth. Aaron S, Even if PDO remains neg, temps will still continue to rise. The oceans can only mask/hide some of the heat for some of the time. We are still getting all time warmest months without an El NiÃ±o started this year. It really doesn’t matter so much about what Solar or PDO does at this point, we will still get decadal warming with 400 plus ppm CO2. You are assuming the extra warming this century was from feedbacks to CO2 and not the sun or something else like random drift. That is where we disagree- there is great uncertainty in your assumption and it is not driven by the data. I do agree with you that this hiatus is nothing special in the longer data sets (HadCrut4 has short term negative trends during this century of warming for example). However, The models have failed for 15 years and include obvious false precision regarding the relationship between CO2 and surface temperature. This FACT requires explanation, and implying the heat is temporarily stored deeper in the oceans is plausible, but even if real destroys the validity of the models moving forward. How much heat will return to the earth’s surface? When? How? Your argument is based on assumptions that can only be tested in the future, and there are alternative explanations that also need tested (nex paragraph). Thus the uncertainty is very high in the earth’s sensistivity to CO2 and all we can say now is the models do not curretly have it nailed and need redone. If you disagree, then please explain? Without the feedbacks from the direct influence of CO2 is doubling it even catastrophic? Furthermore another fact: there is abundant evidence the sun’s magnetic activity greatly impacts the earth’s climate and some evidence for a mechanism via cosmic ray’s and the state of water in the atmosphere (cloud cover). It is not in the models in any way, which is a smoking gun for me to look at. This could be a first order variable for the climate system. The IPCC itself basically just say: we don’t understand the relationship between magnetics and climate so we are ignoring it. Furthermore, magnetics are only part of the story to the sun’s potential impact, there are also CME’s, UV and higher frequency components, feedbacks to water vapor and other GHG associated total solar flux that are not considered. I will pass Salvator’s challenge to you- when in the last 350 years can you say that a prolonged solar minimum of sunspots, or a prolonged solar maximum has not been associated with a drop or warming of global temperatures? ….These deep-ocean currents are driven by differences in the water’s density, which is controlled by temperature (thermo) and salinity (haline). This process is known as thermohaline circulation. In the Earth’s polar regions ocean water gets very cold, forming sea ice. As a consequence the surrounding seawater gets saltier, because when sea ice forms, the salt is left behind. As the seawater gets saltier, its density increases, and it starts to sink. Surface water is pulled in to replace the sinking water, which in turn eventually becomes cold and salty enough to sink. This initiates the deep-ocean currents driving the global conveyer belt…. …The conveyor belt moves at much slower speeds (a few centimeters per second) than wind-driven or tidal currents (tens to hundreds of centimeters per second). It is estimated that any given cubic meter of water takes about 1,000 years to complete the journey along the global conveyor belt…. With the profusion of papers being published ‘explaining’ the pause, it’s becoming increasingly obvious that the new consensus will be that climate change is causing the climate to not change. I hope there are no ‘climate is static’ deniers here. Will, you are either making fun of natural variation or negative feedback explanations coming from current research to explain a possible moderate slowdown in surface temps only over a statistically meaningless span of time. Assuming you ignore the findings of Cowtan and Way. Either way we will get a very good verification of their findings once PDO flips or we start breaking monthly records even with neutral conditions…. Oh wait that’s already happening, never mind. Here is a great view about surface temps from Tamino. Ah yes, the old “I’ll torture the data until it confesses” Tamino. I get a kick out of some of Tamino’s stuff. He likes to remove things that he thinks caused cooling and then say “look, if we take away the cooling, it’s still warming”. Plus he is such a class act, always so civil to everyone – Not. If we take away the warming, it is still cooling. Which end of me will be frozen and which end will be boiling? Firstly, we have the “possibe moderate slowdown” as you just cant bring yourself to acknowledge the lack of warming to the point where you now have to rely on a mathematical manipulator to support your lack of acknowledgment. Secondly, we have the tactic of claiming it is not over a sufficient time frame, however the lack of a time frame never stopped people like you when the planet was warming. Thirdly, you now infer a standstill in warming by blaming it on the negative PDO but are too bound up in self importance to have the cognitive reasoning that states “maybe the rise in temps was due to the positive PDO”. Fourthly, you then throw caution to the wind and state we will start breaking monthly records no matter the conditions and then without breaking stride triumphantly declare that we have been. All the while you never stop to consider the stupidity of your position, you are not cognisant of the fact the models have failed, the temps are not rising, atmospheric WV is dropping whilst CO2 continues to rise. Your feeble excuses are just that feeble, they are not soundly grounded in evidentary based science. Yes, and I made all A’s in college, except when I didn’t, but that is because the dog ate the homework. Not sure what “in the climate system” exactly means but effectively there certainly is noise in the DATA SERIES. From first to last there is an increase of 0.6, resulting from 437 monthly changes which changes average just under 0.1 in absolute value. Looked at in another way, a 50/50 random walk of 437 ups and downs each of magnitude 0.1, only has to have 221 ups by chance compared to 215 downs by chance** to produce a net up of 0.6. Of course, since the UAH result is up and not down, that is slightly probative for secular up trend as against alternative hypotheses of no trend or secular down trend. If one puts the series through a resampling algorithm, the result is indeed as statistically informed intuition suggests; i.e. it could come from a random walk with no particular features of a long-term nature. **the kind of imblance which is more probable (two-sided) than an exact equality of ups and downs. It is a beginning exercise in statistics to calculate the distribution of the net imbalance in a certain number of coin tosses. I notice now that it was Salvatore who wrote about noise, not Massimo. If you divide the anomalies data given by UAH into ’20th Century data’ and ’21st Century’ data* and run simple regressions against time for the two periods: you will find an R^2 for the time trend in the 20th Century (since 1978)of 0.108, and an R^2 for the time trend in the 21st Century (to date) of 0.006. That is to say “the trend” explains 11% of the variation in the earlier period and almost nothing of the variation in the present Century. counting 1 to 100 makes up a Century. With some luck we might eventually crawl back up to the temperatures of the Climatic Optimum of 7000 BC! But if this solar cycle business is going to delay things for a hundred years or so, we will all be dead. Bummer. If it is too cold for you, move towards the Equator a few hundred miles. If it is too hot for you, move the other way a few hundred miles. If there is Sea in the way or Injun Country – too bad. Aaron we don’t know for sure how long prolonged solar activity will last or the degree of magnitude change. This is why I have tried to state specific solar parameters which I feel that are needed which would translate into a climate impact. Noise is present in the climate system from volcanic activity ,PDO phase , ENSO activity which will super impose themselves on the global temperatures but more importantly then global temperatures just going straight down which will not happen , will be the troughs and peaks in the global temperature trend going forward. Will the troughs be deeper while the peaks are weaker. If so and solar activity is very weak during this time period then I think I will be on to something. On the other hand if the troughs and peaks in global temperature do not decline or worse rise then I will be wrong. One last point I would like to make is solar activity for the past few years has been well above my criteria ,due to the recent weak but still solar maximum of solar cycle 24. Odd that the monthly figures for 2013 and 2014 included in Dr. Spencer’s post do not consistently match the monthly figures in the “uahncdc lt 5.6.txt (Lower Troposphere)” dataset that he provides a link to. 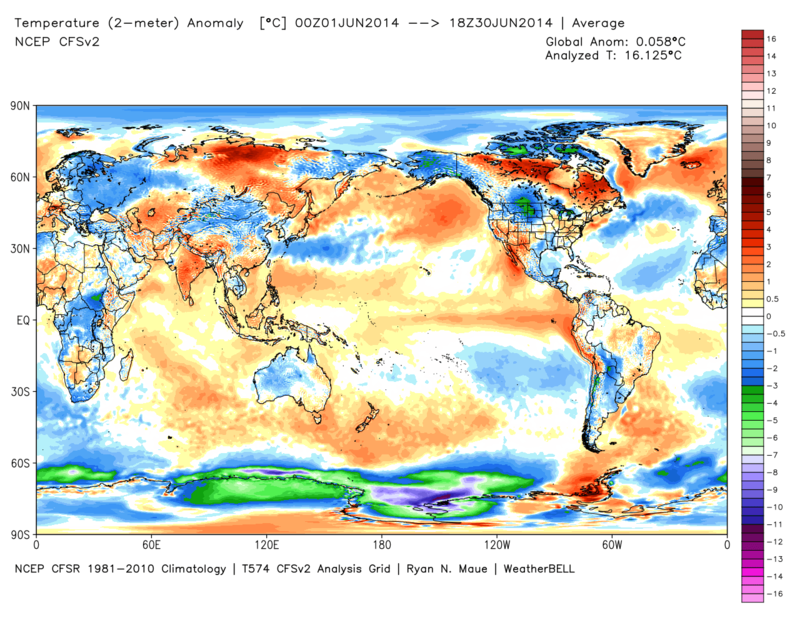 For example, the post shows the February 2014 anomaly at 0.170 but the dataset shows it at 0.18. There are other examples as well. Paper finds a decrease of IR radiation from greenhouse gases over past 14 years, contradicts expected increase – cloudiness blamed for difference. A paper published in the Journal of Climate finds from 800,000 observations a significant decrease in longwave infrared radiation from increasing greenhouse gases over the 14 year period 1996-2010 in the US Great Plains. CO2 levels increased ~7% over this period and according to AGW theory, downwelling IR should have instead increased over this period. Two papers that show a different result then expected. When you’ve got periods of low solar activity, like now, two things happen. One thing is that the jet stream on average goes farther south, and the other is that it swings more wildly north to south. And that means we get much bigger extremes in temperature. Man-made CO2 is also only 1/1000th of total greenhouse gases– which, in turn, only account for 15 degrees of global temperatures. So a 40% increase in CO2, is like bringing a kid along to a ball-game with 1,0000 people watching, i.e. it’s no significant difference. Why is the data different between Weatherbell and Satellite global temperature deviations? I am curious . Thanks to anyone that can answer the question. Think of it as a rectal thermometer vs. oral, i.e. it’s not which end you’re measuring, so much as the CHANGE– but neither one tells you what’s causing it, while there’ll always be some huckster trying to sell you snake-oil… and you’ll end up getting your temperature taken another way, ALSO end up. Eeeking out new global temperature highs after 16 years is not catastrophic warming. It’s slight and mostly beneficial warming. However, I choose to give the most weight to 16 years of observations(as well as the prior 100 years) vs the output/solutions of a bunch of mathematical equations that climate scientists fed into a computer to project temperatures. Especially since the temperature is LOWER than 16 years ago. It’s also the accuracy-factor, i.e. we’ve also measured the speed of light as being faster than previously measured– but nobody’s dumb enough to think it got faster! Not even the IPCC. We just measured it more accurately than before; and the same can be true of global temperatures. It’s hard to know who to believe, isn’t it? On the one hand every second week a climate expert tells us that global warming will make El Nino’s stronger and more powerful. Hansen has been predicting super El Nino’s around the corner for a decade now. Trenberth is claiming that the latest El Nino (which was going to, but didn’t form) might be the biggest on record. Yet other consensus scientists predict that the tropical pacific is moving towards a ‘perpetual’ El Nino state. …Yet this particular explanation for the failure of model predictions is due to an ‘unusual’ run of La Nina’s, sort of the opposite of El Nino’s. If I was a cynical person I’d conclude that all these guys have no real clue what they’re talking about. Their predictive track record is horrible, anyway. Let’s assume that’s correct; that would place it at about 50-50. Meanwhile, the scientific method requires that a proposed hypothesis, MUST be supported by proof beyond a substantial margin-for-error of at LEAST 90%, in order to be accepted over the CURRENT belief. (And 90% is the lowest margin, whereas it’s usually closer to 99% when many factors are involved– and claims of changing global temperatures require MUCH higher margins). So those who use the term “climate change denier,” thus forfeit even the PRETENSE of a scientific argument, since again the scientific method requires the PROPONENT to has to prove their argument– NOT the skeptic! They also use force-methods of intimidation, selective funding and harassment and slander of anyone who doesn’t support their position. So as far as “knowing who to believe”: you can start by ruling out the AGW crowd, since they’ve undermined their own arguments AND credibility with their coercive, underhanded, defamatory and deceptive tricks; it’s like trusting Hitler with money to invest in Israel bonds for you. The activists calling people ‘deniers’ (in the same sense religious people used to call non believers ‘pagans’) or who make up fake studies claiming that 97% of the papers they’ve read (most of which they don’t understand anyway), agree with their preconceived ideas, are generally not the same people who make predictions or theorize about the behaviour of the climate… So I don’t think it helps to conflate the two. It is a defunct parrot with its feet nailed to its perch. Not an “It’s there if you look hard enough” sort of warming. And certainly not sixteen years of this yawnfest. And I was promised that I would never again have the painful experience of watching my wife shovel the snow from our quarter-mile of drive. Why doesn’t anyone mention that temperatures might not be increasing, but rather measurements have simply gotten more accurate? To say “the earth is warming,” is like saying “Natural gas is increasing” after we started fracking– i.e. it’s a fracking illusion! Today we have more sources of information with greater accuracy than ever before, so it’s impossible to say the cause (if any) of global temperatures without similar measurements from before. Today we’re measuring deep oceanic temperatures, underground lava-flows, and many other things– all with more representative sampling– to give a much more accurate picture of the CURRENT global environment. So for all we know, the ocean could be getting warmer at the bottom from increased subsurface magma, resulting in outgassing of heat to the surface. But we didn’t have deep-water probes in the 70’s, so the IPCC is ASSUMING many factors for which it has no basis for comparison. As a result, the IPCC’s claimed causation-formula between CO2 and global temperatures is such an outrageous fantasy as to be laughable– even if ice-core samples were accurate (and I do mean IF). This is for the simple reason that greenhouse gases only account for 15 degrees of the Earth’s temperatures, and man only accounts for 1/1000th of greenhouse gases! So a 40% increased in human emissions is like bringing a child with you into a crowded mall, i.e. it won’t make any real difference. Your last argument is like claiming that Ebola must be harmless because it’s only 0.00000001% of your body mass… So it’s a kind of stupid argument isn’t it? But I would agree with the first part of your post. Climate Science in most domains is starved of good data, so it’s actually very hard to be very certain of very much. Her last argument isn’t really that far off, I think you analogy is in accurate. Bringing a child to a crowded mall is adding one more like kind to a group and will not likely make a difference. The Ebola virus to a human host is not adding like to like, and this unusual addition may result in a large effect. This type of argument is a logical fallacy normally called An Argument From Personal Incredulity. Sarah, There are many ways to take past measurement techniques into account. NOAA and NASA discuss their techniques if you want good examples. There are also many independent ways to use proxy data to confirm past temperature readings. There are also other indirect ways to measure energy gain on plant earth. Glacial retreat and NH snow cover are good places to start. Since these comments are on surface warming, I would like to point out a very very new study on Aerosols. Anyone who understands climate forcings, understands that aerosols (another product of dirty fossil fuel combustion aside from GHGs) are the biggest wildcard. They are overall a large negative forcing. Directly they reflect sunlight, indirectly they influence low-level cloud formation that can have an even greater cooling influence. This new study which unfortunately is behind a paywall suggests that the IPCC underestimated the negative forcing of these aerosols. This is bad news. Aerosols may be temporarily masking the overall impact of AGW more than we thought (at the higher end of the error bar). It can’t last forever as coal burning (especially in east Asia) will begin to subside or or the use of scrubbers increased. Aerosols, unlike CO2 come out of the atmosphere in a short period of time (years). Once this begins to happen we lose the masking effect and more sunlight reaches the surface. This paper makes me think that aerosols are a bigger influence on current surface temps than people realize. So much reduced energy from the Sun and yet the planet is still gaining heat rapidly (sea level rise from thermal expansion and ocean heat content gain). Maybe. Although you’ve probably got it backwards. Because aerosols can no longer explain the “cool” period in the 70’s as calculated by climate models, this seems to suggest that climate models underestimate natural variability, therefore overestimate global warming. This is more consistent with recent evidence, such as the 10-18 year ‘pause’ in global temperature increases. My advice, worry more about real world problems and less about theoretical or imaginary ones. I suppose I should also point out that IPCC climate models all assume that clouds and water vapour are net positive feedbacks. The paper you linked to suggests they are actually a negative feedback. So it’s not clear to me how you figure this paper means it’s “worse than we thought”. If it was as you wrote, it could not be a problem indeed. So, if the extinction time (lifetime) in the lowest part of the atmosphere depend mostly on rainfall, I can’t see how could them accumulate for years in the atmosphere to compensate the last 17 years of gradual and inexorable almost linear increase of CO2. And more, we in Italy constantly measure the particulate in our cities. They change highly day by day, but AFIK I never heard of any study who found any temperature change linked to their concentration. I know, I know that. It’s just that sometimes I like to do rhetoric questions. It appears you are referencing more work on Global Dimming and then circle around to Deep Ocean Heating. Both of these “fudge factor” theories to explain the issues with the modeling only further drive a stake into the credibility of the current climate models. As one who is watching this debate unfold, the growing spinning in the AGW community is becoming almost laughable. At some point it’s best to admit the models need more work and shouldn’t be used for anything more than “entertainment purposes”. 1) Aerosols from hydrocarbons increase albedo and are not included in models enough. 2) Surface temperatures do not represent the earth’s temp. and CO2 impacts Earth temp not surface temp. Hey another convert… way to go man! prooud of you. Joking, just joking. have been over since we have been blessed with the peeler. and attachments to help you get the job done. With no atmosphere, about the same as the moon, around -15C. If the question is one of comparative statics*, no one knows the answer, or even if there is a meaningful answer. The immediate above was meant to be a response to the question about water vapour. In response to “-15 C without ANY atmosphere” , this should not mislead. The tropics would be much warmer than -15 C and much warmer than at present, at least during day time! And, of course, that means without liquid water, because liquid water means water vapour above it, at any and all temperatures – which would be an atmosphere. That would be an increase of 1% in total greenhouse gases. The common-sense view would be “that ain’t much;” especially in view of the fact that for each hemisphere, each year, there is a big experiment in increased temperature and added atmospheric water vapour, without causing any run-away effects*. It is called Summer. * The residence time of water in the atmosphere is only ten days. If it gets humid it rains. This article cites the IPCC as saying humans need to cut global carbon emissions by 40 to 70% by 2050 to avoid catastrophic global warming (which is more than 2 C). 1.the models to base this extreme warming are wrong as discussed here. 2. Even if each individual cuts, the earth’s population will have grown (about 11 billion) by then. So really for each of us to reach that goal we all need to go to 1/3 our current consumption. Impossible. Someone has to be brave and do the self-sacrifice thing. I have a mother-in-law and several neighbours I am willing to give to the cause. The fack can’t no longer be disgised that a Krysis is onto us. Busted. My plagiarism wos shameiaful – but obvious! Impossible to do that calculation bc there would be no trees, and that changes everything. Also no methane bc it oxidizes into co2. John IMHO water vapor is the huge uncertainty in all of this. Water is exceedingly complex. It has different properties in different states. It can be a ghg or it can store huge amounts of energy in oceans, and even reflect energy as ice. However, the ultimate complexity is with clouds. They can reflect, they can insulate and it depends on abundance elevation and type. I don’t think anyone can answer that question. If the models have the direct impact of CO2 correct then there is extra heat in the system but during global warming consider the following variables: CO2 was increasing, sun was in a long term max, PDO was peaking, and the strongest el niño in many years … How can you possibly say what role each of those played. So i dont know what role CO2 played in the extra heat. Fortunately the sun and pdo just changed so this will help understand but it is a decade away. What I do know is most of the catastrophic AGW is dependent on the feedbacks because we have seen .9 warming since 1900 and doubling CO2 is about 1 degree C. Maybe someone else can provide a better answer? Aaron, if the doubling of co2 brings 1 degree celsius of warming then would it be correct to say that the rise in co2 (one third of doubling thus far…) has brought at least .3 degrees of warming? Depends if the warming directly from CO2 is understood and it is very difficult to scale up lab experiments and in correlations with paleodata it is not easy to isolate CO2, and it is probably not a linear system. However, in general I do think CO2 is a GHG so doubling it will warm the earth, but I am not so sure of the catastrophic part. You have to remember that if you take a warm coke and a cold coke and drop them, then open the top you get dramatically more co2 released in the warm one. Likewise any correlation between CO2 and temperature is difficult to interpret bc CO2 could just escape the warming oceans. When I tought geology at ASU they had an old archive of VHS videos and one was the early days of global warming research in the late 80s. This historical video was interesting because they only had about 100,000 years of ice core data. The association between warming out of the ice age and CO2 was implied because of the strong correlation. however we now know there is approximately a 1000year lag in CO2 at the inflections between ice age warming and cooling. Even the IPCC and Hansen agree to this (I saw him address this issue at the 2007 AGU). Basically, the models changed to suggest that CO2 is initially released from warming oceans that are initiated by eccentricity,, but then CO2 takes a life of its own as a positive feedback loop and forces much of the heating. Of course the obvious issue is then why does it not run away? Idk. It’s a complicated question. So, nobody really knows how much warming (on it’s own) the doubling of co2 would bring then, right? A black-body-like object loses energy through radiation at a rate which is proportional to the 4th power of absolute temperature. The way the atmosphere is at present, the earth returns to space (mostly by radiation from the atmosphere), over sufficient time, 100% of solar input. It must (plus a trickle of heat from the inside of the earth). If the atmosphere were, say, uniformly 10 C warmer than at present, the Earth would then be losing to space 105% of the energy it receives (assuming no change in Albedo) from the Sun. Which is an imbalance that is definitely “not on.” It follows that the atmosphere’s temperatures have to stay pretty close to where they are now. They can wander up or down by a few tenths of a degree C, without much difficulty from the Stefan-Boltzmann Law; but sustained excursions are impossible. Under certain conditions – if radiation alone were involved in the net transfer of heat outwards – the surface could warm relative to the atmosphere (the gradient of temperature from the surface to the atmosphere could change). But, because there is an adaptive non-radiative bridge* carrying most of the net heat transferred from the surface to the atmosphere, this gradient is also, in fact, extremely constrained. * Water evaporating from the surface and condensing in the atmosphere is the main part of it. Also, conduction is significant. The overall system is determined by the simplest of energetics. and the only fatal flaw with your logic is that when anyone has run calculations on such systems they find your mechanism does not work. They find huge warming from elevated human driven CO2 emissions. This is too vague. I meant “with the atmosphere ALREADY functioning as ‘the radiator’ of the earth.” Adding more CO2 or water vapour would not change this in any important regard. As in a motor-car engine. Moderate deviations from black-body behaviour, of course, do not affect the basic point that thermal radiation behaviour is very “sensitive” to temperature. So we now have record SST levels despite the lack of an El Nino, plus a quite sun and negative PDO. Seems the CO2 warming is dominating afterall. Now who predicted that? Oh yeah those climate scientists. Looks like the experts were right afterall.